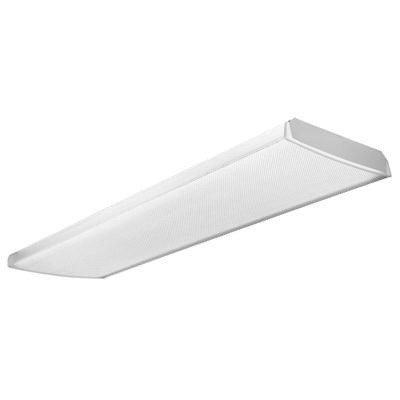 Lithonia Lighting Low-profile wide body wraparound fixture in baked white polyester enamel finish, features die formed code gauge steel construction and is pretreated with 5-stage iron phosphate for superior paint adhesion and rust resistance. It has prismatic acrylic diffuser with sonically welded luminous ends. Wraparound fixture uses four 32-Watt T8 lamps with 2-Pin socket. Lamp with electronic instant start ballast has voltage rating of 120 - 277-Volts. Wrap-around fixture measures 48-Inch x 15-1/2-Inch x 2-15/16-Inch. It is ideal for applications that require clean appearance of low-profile brightness controlled wraparound. It offers broad distribution of light for offices, schools and corridors. Wrap-around fixture is UL listed and CSA/NOM certified.